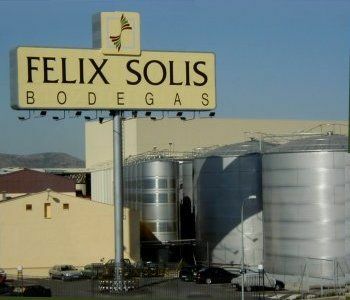 Bodegas Félix Solís is a family owned wine company with headquarters in Spain. It is best known in the UK for its Viña Albali brand from Valdepeñas, though the company also own wineries in Rioja and Ribera del Duero. Approaching Ribera del Duero at the end of a long drive across the flat plains west of Madrid, over the Sierra de Guadarrma mountains and on through rolling farmland, the remoteness of this area is startling, but a sense of excitement is almost palpable. We pass new bodegas being built, lorries carrying shiny winery equipment, and signs of growth round every curve in the road. The established names of Ribera del Duero like Vega Sicilia and Pesquera are being joined by more and more wineries, intent on tapping into this high quality region to service a strong demand for Ribera del Duero wines in the restaurants and bars of Madrid, and in export markets worldwide. Amongst them is Pagos del Rey, Félix Solís’s dramatic new winery that rises from the vineyards of Olmedillo de Roa. It is currently the largest in the Duero. Notes on the wines follow, but the Altos de Tamaron Joven is already in Sainsbury’s at £5.99, making it one of the cheapest wine on the shelves from this glamorous appellation. The company philosophy is always to employ economies of scale, and to invest relentlessly in technology and back-room systems, to make sure their wines over perform within their price range. The project is extremely impressive, from the beautifully designed reception and office areas, to the vast working winery, constructed as one continuous space with no pillars to interrupt the workspace. Natural light floods the area through windows that ring the top of the sheer 40-foot walls, but that cantilevered overhanging roof protects the interior from the baking heat of the sun. This is a cleverly designed space glistens with stainless steel and the latest in wine making technology. One floor below, the beautifully constructed showpiece barrel cellar contains 7,000 barriques (mostly French) and is filled with classical music and opera as the wines slumber in air-conditioned cool.In fact, the Solís family have a long association with Ribera del Duero, including Felix’s maternal grandfather, who was a grape supplier to Vega Sicilia. Visiting the vineyards immediately explains why the family have invested so much in this region. Winemaker Gregorio Ruiz takes great pride in hectare after hectare of old bush vine Tempranillo, known locally as Tinto del Pais. 70-year-old vines, with trunks as thick as small trees, yield just one and a half kilos of concentrated grapes in four or five heavy bunches. There is no need to green harvest (crop thin) these vines: all that is needed is an experienced hand on the pruning sheers, to form the characteristic crown shape, where the vine’s thick foliage shields the grapes from the worst excesses of the mid-day sun. 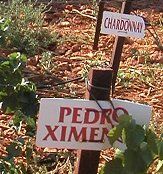 The average age of the Bodega’s vines is around 35 years, even with extensive newer plantings. Right, Gregorio, Félix and their chief viticulturist assess the almost ripe fruit.Having nibbled a few of the sweet, intense grapes from the older vines, I did the same with some from recent trellis-trained plantings. The juice was just as sweet, but the flavour was not nearly so intense – even though these vines had been pruned severely to restrict yields. These extensive old plantings of Tempranillo are worth their weight in gold. 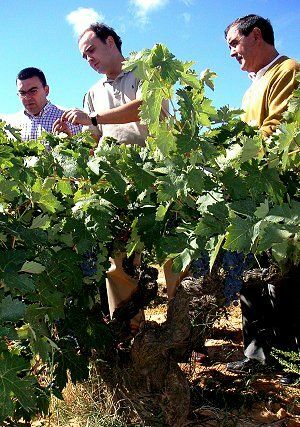 Time will tell whether Pagos del Rey can join the upper echelons of Ribera del Duero. There is a fanatical attention to detail and a willingness to invest in quality that is obvious in the operation. Given the wonderful raw materials of those ancient, dry-farmed grapes, the future looks very promising indeed. 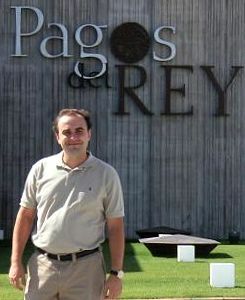 “Altos de Tamaron” is the main label being produced by Félix Solís from their new Ribera del Duero winery called Pagos del Rey. Most of these wines are not yet released, but prices and stockists are given where known. This is the un-oaked, youthful wine of the range, which has a moderate 13% ABV. It has a very vibrant, deep crimson colour and an expressive nose with bright raspberry and redcurrant fruit, a certain floral aspect and a dense, full character. On the palate it is very smooth and caressing, offering a flood of sweet, creamy raspberry and black fruit. There is a fine tannic background and well-balanced acidity, in a wine of depth and style. Very good indeed. Limited stock in some Sainsbury’s £5.99, also in Thresher from early summer. The average age of the vines for this cuvée is around eight years old. It spends three months in oak. It has a dark, intense colour with a big, spicy, sweetly-perfumed nose hinting at violet and crushed raspberry. On the palate it is smooth and creamy-textured, with a dense, solid core of red berry fruits that are sweet and intense. The oak gives a nice spiciness and rich tannic support into the finish, which is powerful and quite long. Very good indeed. Barrel sample. Extremely dark and dense in colour, the nose is particularly chocolaty, with toasty oak adding spice and a sandalwood note, over good, solid black fruit. On the palate there is a raft of cherry fruit, with again that hint of chocolate and the oak adding a spicy edge. This needs a little time to integrate, but has balance and power. Very good indeed. The Crianza (13.5% ABV) spends 14 months in barrel and has developed a meatier character, with a dark, muscular structure, a smooth sheen of oak, and a core of tight black fruit. On the palate it is very harmonious, with a dark cherry-skin fruit quality, hints of meatier plum fruit and a nicely integrated oak character. Tannins are fine-grained and add good grip, with plenty of concentration and a long, balanced finish. Very good indeed/excellent. Barrel sample. The Reserva spends 36 months in the cellars, 24 of those in barrel. It has a very deep colour, and the oak is subdued adding only soft, elegant spicy tones. The aroma is of crushed blackberry fruit, with again some floral and incense hints. On the palate there is a resinous edge of oak set against a great plush, thick, sweet black fruit core that is very intense. Tongue-tingling spice and concentration and a lovely tang of cherry acidity really lift the finish. Smooth and elegant, this will be very fine indeed when released in 2006. Excellent. Barrel sample. 90% of the oak for the Gran Reserva is French, and it spends around three and a half years in barrel. It will be released late in 2007. It has an almost opaque crimson colour and a big, sonorous nose of cedar, meat stock and solid, ripe black fruit. This wine is fantastically plush with an intense depth of crushed-velvet fruit reminiscent of raspberry and cassis. Polished tannins and a warming in-fill of coffeeish oak play second fiddle to the purity of fruit on the finish. Excellent/outstanding. Barrel sample. 7% Cabernet Sauvignon joins the Tinto del Pais (Tempranillo) in this wine, an experimental bottling. After two months in new oak (30% of it French) it has been transferred to older barrels. It is very tight on the nose at this stage, with a fine, muscular character that is compact and dense, expressing black fruit and a hint of tobacco andwarmer, earthy notes. The palate delivers a big shock of dense, dark, liquoricy fruit with black plum and damson and a fine-grained tannic structure. Smooth and rich, this has good balance and huge concentration. Fascinating, and potentially excellent. To reach the town of Valdepeñas you will travel hundreds of kilometres south, passing through the vast windmill-dotted plains of La Mancha, so familiar from Don Quixote stories. Here, The Félix Solís HQ was established in the 1970’s, and has been continually modernised and expanded since. Home of UK favourite Viña Albali, this is a winery on a massive scale. With a vinification capacity of over 180 million litres per vintage, and a bottling capacity of 120,000 bottles per hour, it is one of the biggest wineries in the world. The advantage brought about by economy of scale is obvious here, with fantastically streamlined production facilities, and state of the art climate-controlled warehousing all on site. Valdepeñas can trace grape-growing and winemaking back to Roman times, centred on the town of Acinippo, which translates as “grape seed”. In the 15th century records show a new importance for the area, when Spain moved its capital to the city of Madrid, just to the north. The area is vast, covered in a reddish chalky soil, and enjoys a continental climate with summers often touching 40C. It is also an arid area, with little disease, and where irrigation of the vineyards is rare. In this harsh land, old, bush-trained vines perform best. Viña Albali and the popular Los Molinos brand – also made here – rely on a combination of estate and contract-grown fruit. The estate vineyards for Viña Albali cover 340 hectares, mostly of Tempranillo (in this region known as Cencibel), Garnacha and Cabernet Sauvignon. 85% is on unirrigated bush vines. Another 180 hectares is farmed for the Los Molinos label, and there is an experimental vineyard where everything from Shiraz and Merlot, to Gewürtztraminer and Pedro Ximinez, is grown and vinified in a research programme.Nowhere is the scale of this operation better demonstrated than in the barrel cellars. New-world producers can opt to use oak chips, staves and a battery of technology to recreate the effect of barrel ageing. 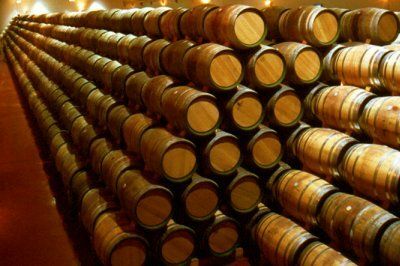 But here, within the strict code of the Denominación de Origen, the investment is enormous, with unthinkable mountains of barriques filling the air with a luscious sweetness as one enters the massive cellars. 70,000 barriques lie in temperature and humidity-controlled cellars, where they age for up to five years in the case of the Gran Reservas. The majority of the oak is American, though the percentage of new oak has been toned down over recent years. The wines of Viña Albali – Tempranillo-based and aged in American oak – have always been compared to those of Rioja. Though this pains Félix Solís Ramos slightly when mentioned yet again, he and Albali winemaker Antolín Gonzáles explain that, like most of Rioja’s best estates, they have concentrated in recent years on reducing the more obvious influence of American oak with its dominant coconut and vanilla flavours. They now work hard to retain more vibrancy of fruit, through changes to barrel and ageing regimes in the cellar, and working in the vineyards to ensure ripeness and concentration. To “over-deliver” is the rather clichéd ambition of many wine producers, but Viña Albali really seems to achieve this holy grail. In a global market, they compete head-on with the unfettered New World and its access to almost unlimited vineyard plantings, oak chips and all the paraphernalia of modern mass-market wine. But this modern-thinking producer compensates by making the best of the region’s traditions, sharpened with a cutting edge of technology. When one remembers that Viña Albali’s wines – readily accessible on supermarket shelves, with even the Gran Reserva costing an “everyday” price – are the product of glorious old vines and the slow, time and cash-expensive process of long barrel ageing, the achievement is even more remarkable. The Solís family has battled to keep their company moving forward, ploughing profits back into constant modernisation. Their success in gaining and maintaining a competitive advantage for their traditional wines in a tough world market is one for which wine lovers everywhere can be grateful. This non-vintage wine is made from Airén and has a light, floral and grape-scented nose, reminiscent of Muscat. On the palate it is quite full and soft, with a peachy quality to the fruit around a good core of apple and pear acidity. Very clean and easy to drink. Good. £3.99 Unwins. Many of these wines are stocked by major supermarkets and chains in the UK. This wine, made from 100% tempranillo has a deep pink colour following 10 hours fermentation with the skins, and quite an earthy, warm, soft red fruit character with a little cherry brightness. It is soft and full on the palate, with mouth-filling dry red fruit. It is really quite savoury, with good acidity. Very good, and exceptional value. Sweet vanillin oak dominates the nose here, over a soft, strawberry-pulp fruitiness with hints of rose-hip and spice. The palate delivers a blast of dry, savoury red fruit with considerable staying power and a touch of elegance in the finish thanks to fine tannins and good acidity. Very good/very good indeed. £3.99 Warehouse Wine Co. See all stockists on wine-searcher.com. This has a delightful sweet-fruitedness about the nose. Aromas of berries and ripe black cherry dominate, slicked with vanilla, toast and spice from twelve months ageing in barriques. There is a tobacco-like warmth too. On the palate this is rich and full-bodied, with a mouth-coating texture of bramble and autumn-berry fruit, and silky, sweet-edged tannins. That softening layer of smoky oak and spices is balanced by very nice acidity, that is seamless and gentle, but does exactly enough to keep the wine fresh and savoury. Very good indeed. £4.99 – £5.49 Asda, Budgens, Co-op, Londis, Sainsbury’s, Thresher, Unwins. See all Reserva stockists on wine-searcher.com. This wine is undeniably Rioja-like in style, but modern Rioja, where the quality and purity of ripe, rich black Tempranillo fruit is allowed to sing and is supported by, rather than smothered in, creamy American oak. It is aromatic, sumptuous and beautifully balanced, with warming tobacco and spice layered with masses of fruit. Great value wine and excellent. £6.49 – £6.99 – Booth’s, Budgens, Morrison’s, Sainsbury’s, Unwins and Thresher from early summer. See all Gran Reserva stockists on wine-searcher.com. The Reserva de Familia is a terrifically well-made wine, where a percentage of Cabernet Sauvignon and some use of French oak gives a warmth and cedary quality to the nose that is quite refined, joining firm black fruit and a softer tobacco-like character. On the palate it is very elegant and polished, with a restrained, savoury, liquorice-edged black fruit character and a warming core of more dense, sweet plum and earthy fruit. The oak is quite briary and very well-integrated in a fine, beautifully maturing wine. Excellent.